Greek Prime Minister Alexis Tsipras spoke to the media after meeting with Greek Defense Minister and coalition partner Panos Kammenos in Athens. Kammenos announced his resignation on Sunday. ATHENS — Prime Minister Alexis Tsipras called Sunday for a vote of confidence in the Greek government, hours after a junior coalition partner announced that he would quit in protest of a deal to end a dispute with Macedonia over its name. 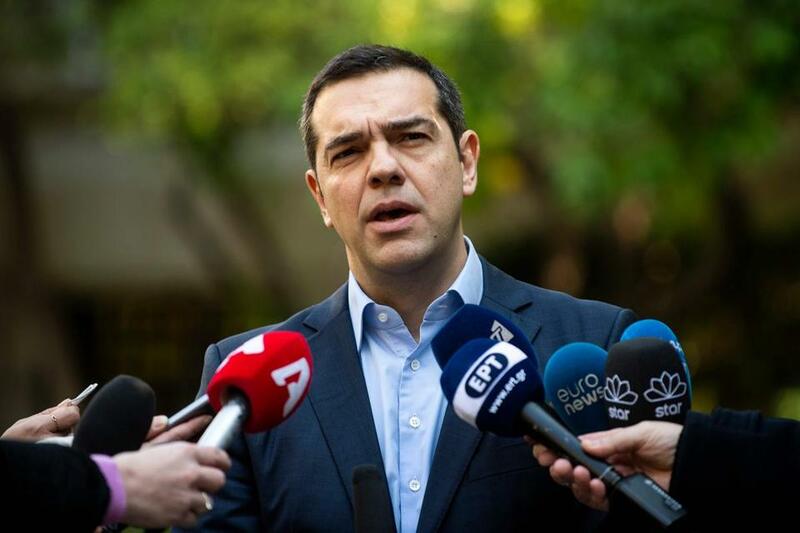 The move threw the country into new political turmoil, fueling speculation about possible snap elections, although Tsipras said his government aimed to complete its term into October. The coalition partner, Defense Minister Panos Kammenos, who is also the leader of the right-wing Independent Greeks party, announced his resignation after talks at the prime minister’s residence. “The Macedonia name issue does not allow me not to sacrifice my post,” the minister told reporters afterward. “ANEL is leaving the government,” he said, using the Greek acronym for his party. His decision came days after Macedonian lawmakers agreed to officially change the country’s name to the Republic of North Macedonia, ending a long dispute with Greece and opening the door for the small Balkan nation’s membership in NATO and the European Union. Greece has long argued that Macedonians were a Hellenistic people and therefore the name could not be claimed by the Slavic people living in the country today. Since NATO requires unanimity to accept a new member, Greece has effectively kept Macedonia out of the security alliance. Shortly after Kammenos’ decision, the leftist prime minister thanked the defense minister for his “irreplaceable, important contribution” to the government. “Our ideological differences with Kammenos were well known,” he added. “Despite this we cooperated honestly and we achieved a lot of significant things, most importantly extracting the country from the upheaval of the memorandums,” he said, referring to Greece’s emergence from its third international bailout last summer. Declaring that his goals were to continue a range of reforms and “upgrade the country’s role on the international stage,” Tsipras said he would seek a confidence vote “directly” so his government could complete its term. “Each must now face their historic responsibilities,” he said. According to a recommendation by the parliament speaker, Nikos Voutsis, the vote was expected to be held this week.